I always love finding new and innovative items. 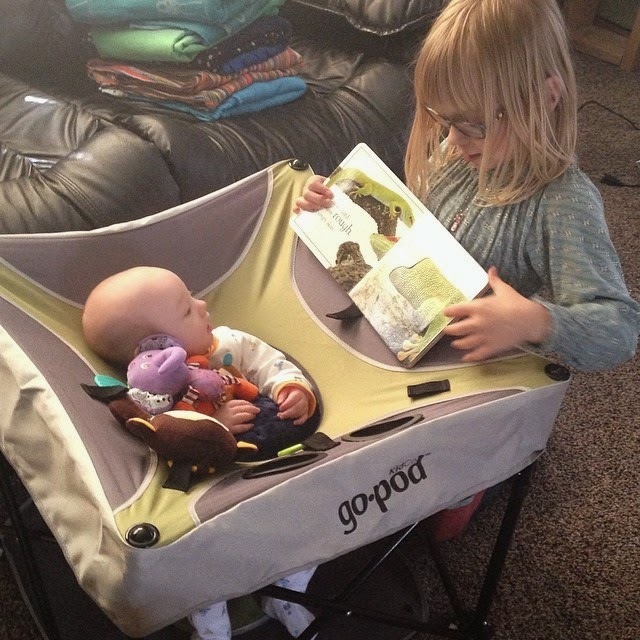 And the KidCo Go-Pod is definitely one of those items. Do you have older children and an infant? Do you do a lot of work outside or do a lot of camping/traveling? If the answer is yes then this go-pod is definitely for you!! 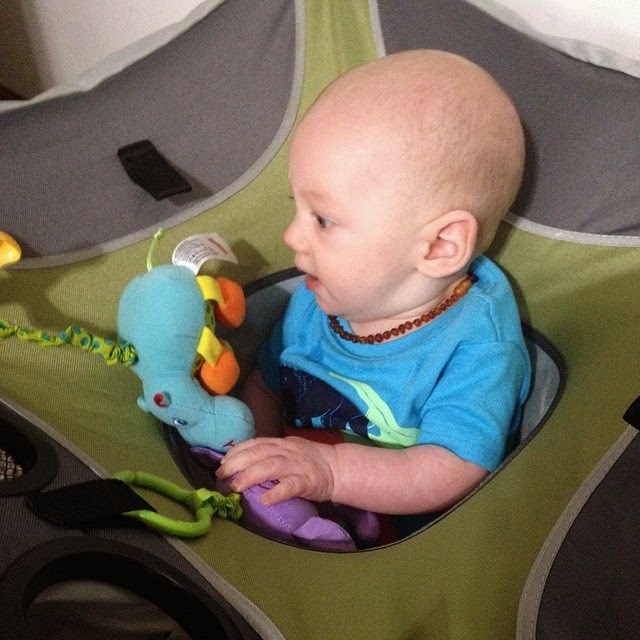 We received the pod in Pistachio and love it SO much! It comes like a camping chair. It unfolds and you push it down until it locks in place. Also there are 4 height adjustments on it. Each leg has one of these push buttons and you can raise/lower it to fit your child's height needs. The seat looks so cute, does it not? This was taken about 3 weeks ago already, he's filled out the seat a bit better now. But he seriously loves it! I originally wanted to get this pod for outside. When the older kids are out there playing and riding bikes this would be great for Liam to get some outdoor time too. Great for the park and traveling as well. But I have to say, I use it indoor more! It is so wonderful for him to get to look around, but the jumper we have overstimulates him with the lights and music so this is truly perfect. Since he's still so little I've had to put a blanket in front of him so he doesn't flop around, but I know it's only a matter of time before he fills this seat perfectly. I love the height adjustment. It's really easy to do and provides months of use out of the pod. It's meant for 4 months to walking age. The seat is very lightweight. I love the floor pad, perfect for being outside, it keeps baby's feet out of the grass, dirt and sand. It's made of a polyester fabric that is easily wipeable (same material as a camping chair). And the frame is made out of steel. This is definitely a durable seat that you can use for child after child. I have personally loved using it and will continue to use it for as long as I can. It is great for indoors and outdoors, a place to put baby or at an older child's soccer game. It folds up very compactly and will fit in your trunk perfectly. I would probably choose the cardinal one. I could really use this summer when we go to our friends houses. I would choose the Go-Pod — P7003 Cardinal, for my new baby grand-daughter, and her camper parents! I would choose the Go-Pod — P7003 Cardinal because red is my favorite color. I know my new granddaughter would love it! I would choose the cardinal. I like all the color schemes, but I like Sorbet the most. It's so fun and bright! I would choose the pistachio pod. If I won, I'd choose this one : P7001- Sorbet. I would chose the cardinal. I would choose the Go-Pod — P7003 Cardinal! i like the sorbet pod! I love the Go Pod Cardinal color! I would pick the Cardinal. I would choose the pistachio....good and neutral! I like the one in cardinal. I would choose the Pistachio color. I would choose the Pistachio. I would choose the Go Pod in Cardinal. I'd love the Pistachio one! I would choose the Cardinal Go Pod. I would choose the Cardinal one! I would pick the Pistachio one. Pistachio!! Love :) Thank you! I would choose the Sorbet! I actually like all three colors, but I think I would choose Pistachio. I would definitely choose the Pistachio colored one. This would be so great for on the go. I think I would choose the red one. I wanted one of these so bad for my son when he was tiny but it was just not in my budget!! It is and would be so great to take everywhere!! Love the green!! I love our bouncer we have now, but it is very heavy. This thing is awesome!!! Looks easy to move from room to room, Yaaaay!